I haven't really been posting on the forum for the last year, I got myself quite busy. I was dabbling in smithing for a while and finally bought a business license and went legit with it, smithing was the only thing that kept my head above water and my bills paid this winter when contract work dried up. I'll be doing most of my work between labor day and memorial day as summer time gets really busy with my full time job. 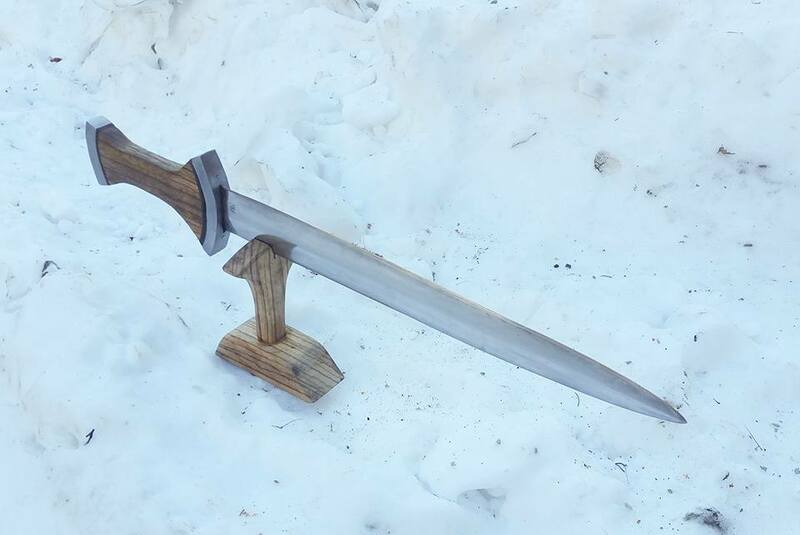 I'm sharing below what I've been working on, I have a couple more swords on the bench right now that are commissions, and some historical daggers and knives that will be worked on soon. If you have any questions, let me know! 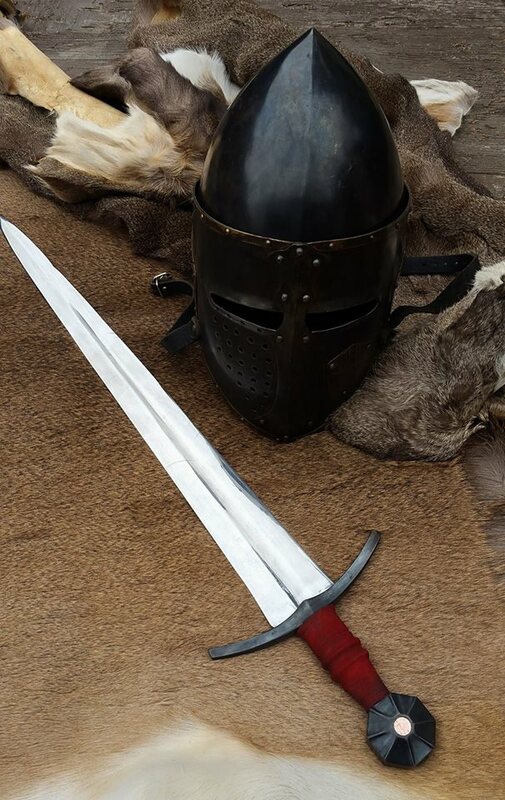 Italian Arming Sword, based off a museum photo. Dismountable handle and blade for stage combat maintenance. Blade is 5160, a blued S over faux gold leaf is in the blade (s is for the clients name). Maple handle covered in dyed leather with risers, chemical blued guard and pommel (easy to maintain for fighting), though the fake peen block which is a nut is fire blued. This one held up beautiful this summer in stage combat. 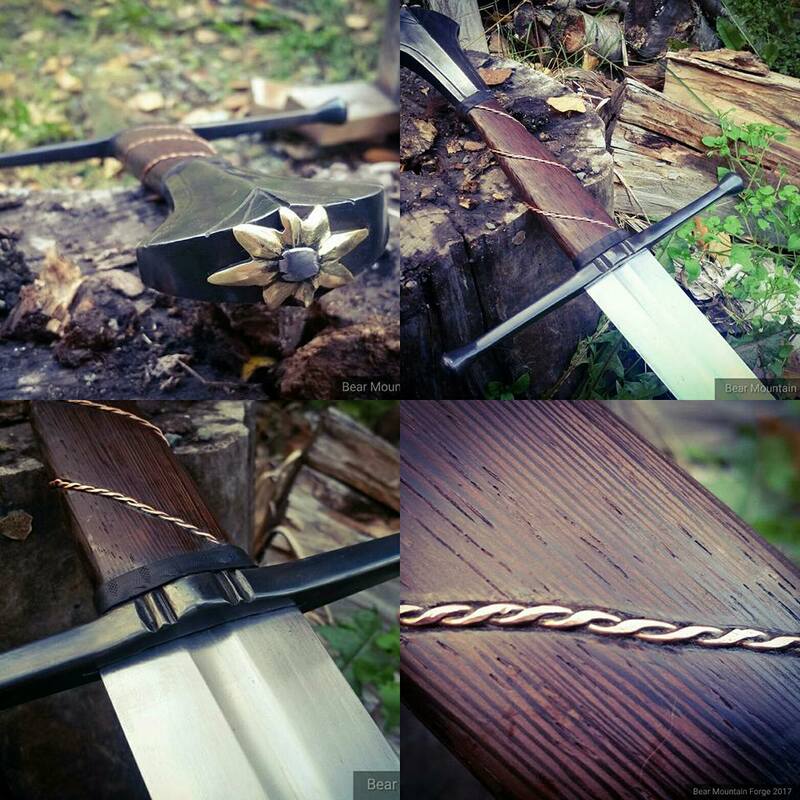 Making a sheathe for it this winter with a companion dagger. Fur Trappers Knife. A knife made from an old leg trap and a piece of found Alaskan cypress wood. 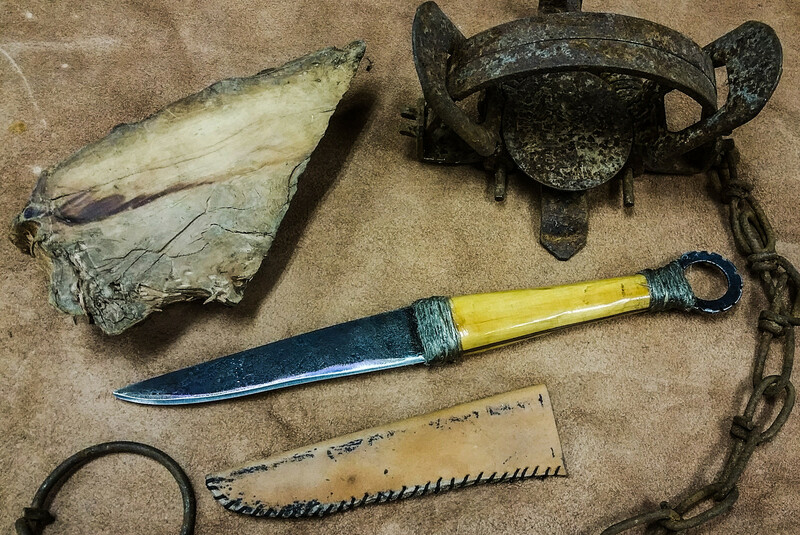 This knife is based off of knives from around 1850-1890 in western Canada that were made from discarded traps. Roughly finished with twine around the cypress and sealed with linseed oil. 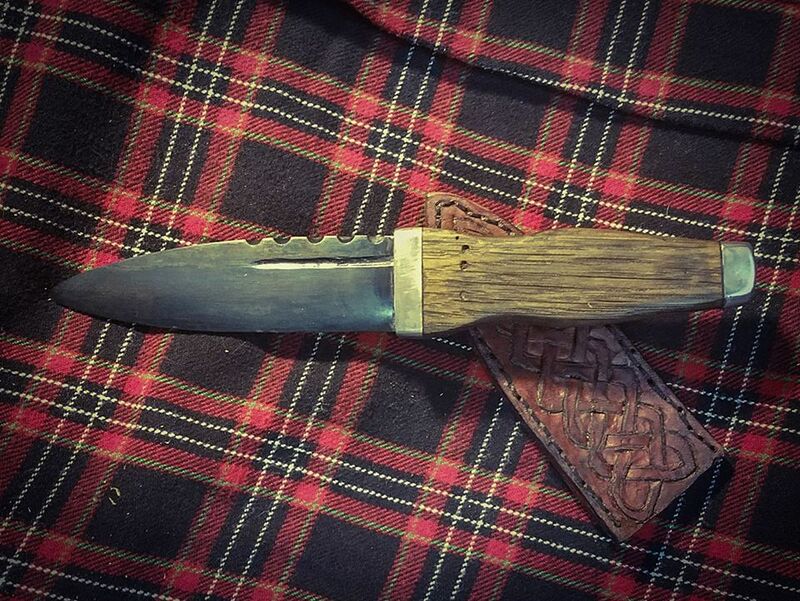 A rustic sgian dubh done in a style that fits a large range of time. Blade is forged from a 100 year old piece of high carbon steel, simple file work spine and a fuller, I aged the steel a little to give it a look that went with the handle material. Handle is diver salvaged virgin oak that probably sank in the 19th century, the holes are from bugs eating the wood on the lake bed (thanks Scott Roush), bolster and pommel are wrought iron from the 1880s with a very light etch. Handle is finished with boiled linseed oil. Tooled leather sheathe. My customer wanted a rustic feel, and because of the size of her hands, she requested a small handle and pommel. 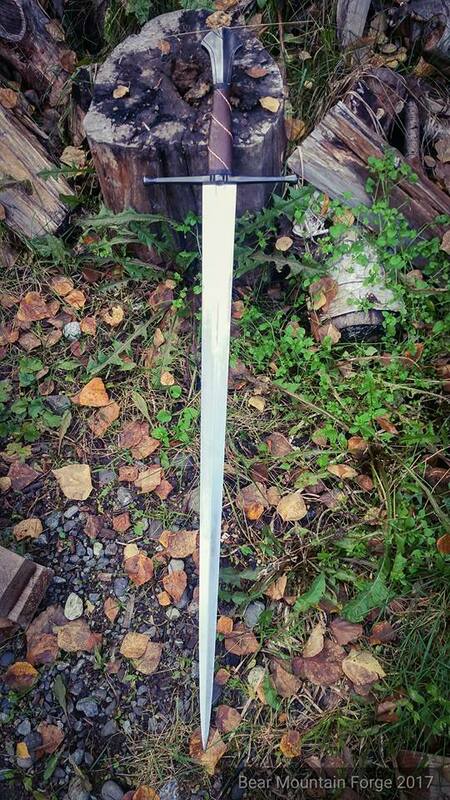 An XIV arming sword. Insert is hammered float copper. Inspired by a surviving sword from the 14th century. It's a little on the short side, but it's a fierce little cutter. Swiss Degen, zebrawood handle (not traditional, but the client wanted a bold patterned wood), wrought iron pommel and guard, brass pins. This was a project from hell. I think I split three handles making it. My latest, shipping it off today. Not really based on anything, but inspired by a lot of various pieces. 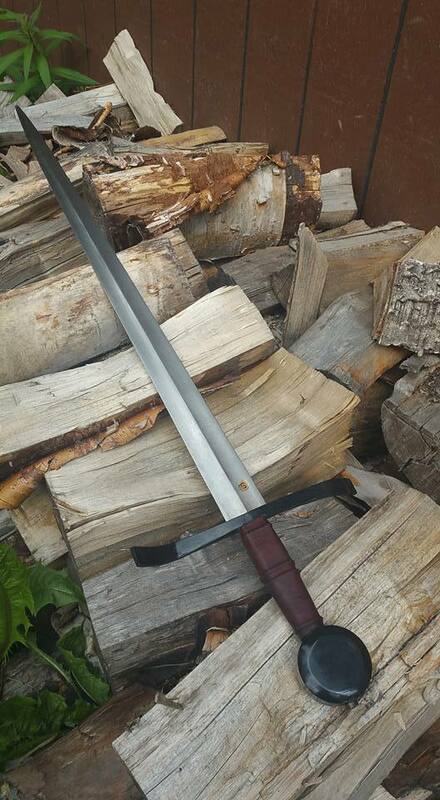 46 inch long sword with 35.25" blade. Pommel is hollow ground and filed. Fittings are mild steel heat blued than chemical blue topper that I brushed back to a dull grey with the heat blue shimmering through. Handle is Wenge wood, with inlaid twisted copper wire, bordered with tooled and dyed leather sealed with boiled linseed oil. Peen block is brass. Blade is 6150. Weight is 3lbs 12 ounces with a POB of 3.5 inches. Feels great in the handle and cuts like a dream. There's still oil on the handle in these photos, the wood has darkened up a lot already and evened it all out. I have an xviii and a xvi on the work bench right now, so stay tuned.